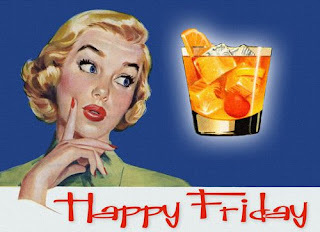 So this is apparently what you get when you search for an 'old fashioned Friday' image. LOL I do like a good old-fashioned, though, so I'll leave it. I actually searched for old fashioned Friday because we're headed to Mackinac Island this weekend. The trip is celebrating my daughter's 11th birthday, and she's bringing her best friend from school. They haven't seen each other since school got out in June, so this should be super fun. The forecast all over Michigan has some storms and rain this weekend (which is why we're taking the boat to the island on Sunday, instead of Saturday). I'm hoping it will take care of my baskets of flowers! My energy is at a zero lately, but the rain comes as soon as I finally muster up the motivation to water everything.... Hope mother nature drenches them like I mean to! Our deck is oh-so-close to done. We can walk out on it now, but I think there's something else going on the railing, and the steps aren't completely finished yet. We're also considering setting a gazebo on it to keep the table/seating out of the sun. Have you done this, or know someone who has? It's too late in the season to see them in person at the store, so we're left with just shopping online. We enjoyed a couple more Hello Fresh meals this week (well, hubby and I enjoyed - the kids don't really get into them). But between a late delivery in early July, a box that wasn't my choices after that, and then this week they billed me instead of using the credit on my account, I got too frustrated and canceled it. I think there are a couple companies I haven't tried yet, so I suppose I'll mix it up now. Summer is getting away from us quickly! Most of August is booked, as well as like half the days left in July! I am happy that the kids have kept up on their 'homework' this month. Each morning after they get dressed and have breakfast, they do a worksheet of math, and then we all read for a half hour. I feel like the mean mom, but they're complaining less now that they're used to it. I'm also quite happy that my nails have been polished at least half the summer. I'm not allowed to have them polished during the school year at work, so it makes me happy to see them nicely done. I had used Color Street a few times for breaks last year but this summer I've been using Essie Gel Polish exclusively. It dries pretty fast, and lasts for more than a week without chipping! It is usually about $10/bottle (I've gotten it at Sally's Beauty Supply, Meijer, and Target), but it's worth it as a splurge for me. I guess I'm soundly in 'summer' mindset....More than half way through my Friday, and I just realized I forgot to nag the kids into taking showers this morning! Whoops! We're hitting the road tomorrow after breakfast, but they're gonna have to shower too. Jack is watching a video with a guy reminiscing about Toys R Us, and it's making me sad. He's pulled old signs out of an abandoned parking lot, and now they're playing the old commercials. So sad! Hope your summer is going great! Jack keeps asking me when my favorite time of year is (he says his is his birthday). I do like spending lots of time with my kids for summer, but I also enjoy my routine during the year. I guess I like the whole year, eh? I bet you will be so happy to have that deck finished. I also live in Michigan and usually enjoy a stormy couple of days but our teenage daughter will be driving from Illinois alone tomorrow and that has me a little nervous. Yeah it seems like summer just started and August is almost here already. My kids are in a summer school program so that has taken away from the summer vibe a bit too. Drove by a shuttered up Toys R Us the other day and felt sad myself.